The start of June found us packing up once again to head out to a ride. This drive would be a bit longer, up to a site called Cowboy Camp outside of Williams, California. This area is known for its heat, so I was preparing for the worst. Lots of electrolytes for Sebastian and salty snacks for me. We rolled into camp, late again. Without anyone telling us where to go I chose the introverts fave location- the very edge of camp. The nature of this position was emphasized by the fact that the bathroom facility was between me and the next closest trailer, making an even larger gap between me and everyone else. I hustled to get checked in and show Sebastian to the vet. In my preparations I had my first experience using athletic tape to wrap around Sebastian’s hooves to make sure his Easyboot gloves stayed on well. I have helped my friend Christina glue hoof boots onto her ponies in the past and am glad to say using tape is nothing like gluing. Sebastian did twist off a hind boot once while catering up a hill, so I figured the tape would be good insurance. I did the Mt. 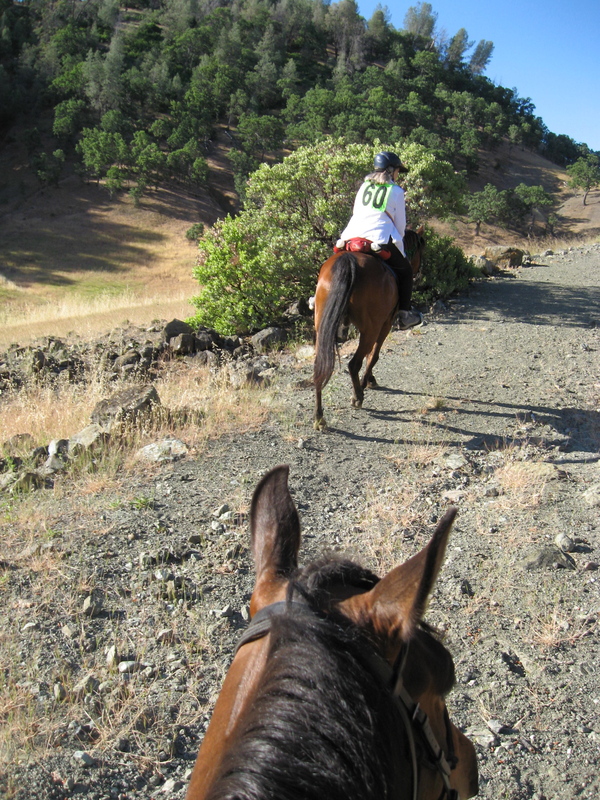 Diablo ride in just front boots, but ended up worrying about Sebastian’s comfort during a long downhill through a solid carpet of sharp rocks. With four boots on I wouldn’t have to think about the footing at all. The vetting in was uneventful save the large grey snake that slithered through the proceedings. Sebastian found this to be very ho-hum. Makes me question his whole I-was-raised-by-wild-horses story. After dinner and the ride meeting that explained what to expect the following day, I headed back to walk Sebastian and settle in for the night. I had lashed both the top and bottom of the hay nets to the trailer to avoid the loudness of hay nets flying around as Sebastian attacked them. I was hoping I would get some real sleep this time. I was not as hopeful, however, when Sebastian started bucking in place beside the trailer. Lots of folks were still walking their horses around before going to bed, and Sebastian found this tremendously exciting. It was short lived and nothing dangerous happened (no pulling back), but enough to temper my expectations for the night. Morning came with more sleep than the last ride, so that was something. I paired up with Barbara and Tuscany (the great horse owned by Barbara and ridden by Sara at Mt. Diablo), which was a huge relief. I hadn’t been sure how the ride would go solo, and didn’t want to impose on an already formed group. 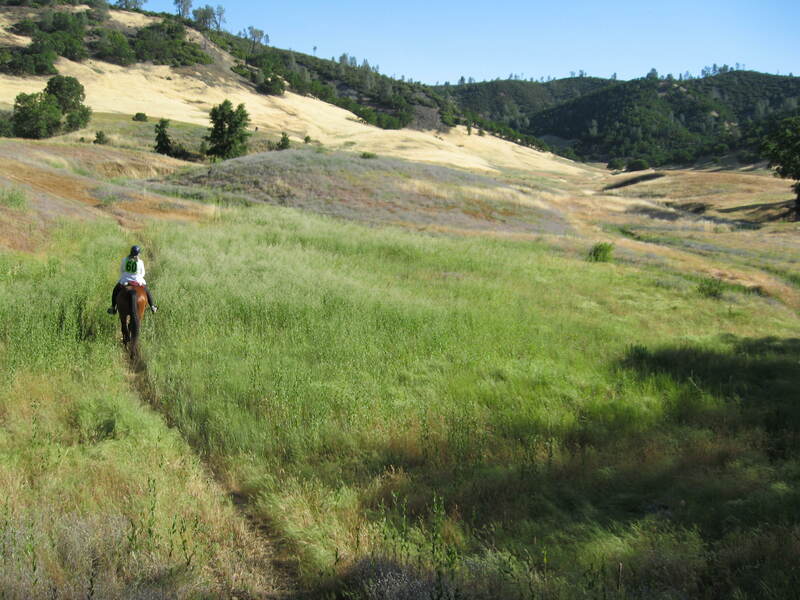 The start of the ride was a long, flat single track trail that cut through tall grasses. Pretty much everyone’s horses were fresh and wanting to race, so there were some tense passes. Sebastian was right there with that energy, prancy and wanting to race. Shortly we got to the first obstacle, so there was a short delay as we crossed the river that we had been riding parallel to. The rider ahead of me, Kay, was riding an inexperienced horse who was afraid of the water. When in water horses lose one of their main defenses- the ability to quickly flee. 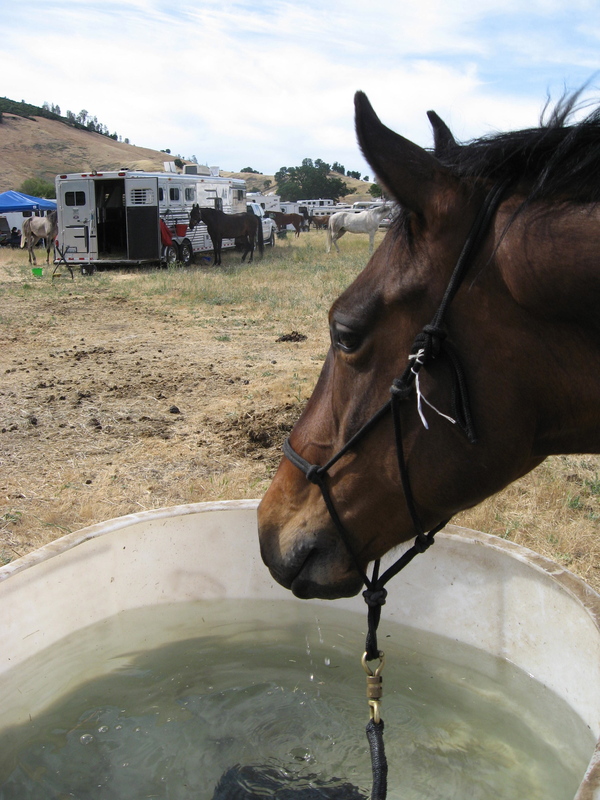 Most horses have a deep, natural fear of water before they are desensitized to it and treat the entrance into water as a life or death situation. 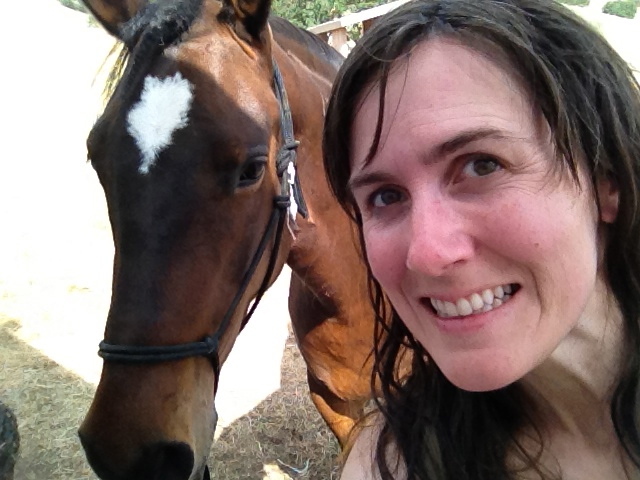 Kay is a very experienced trainer and has brought many horses along in NATRC, so she was doing an excellent job. Still, the scene was dramatic- the horse avoiding the water by skittering out onto a mushy peninsula of grass, falling down and popping back up, slipping around in the deep mud. This was all happening right in front of Sebastian’s nose, as we tried to back up a whole line of people to make more room for the horse and rider. Eventually Kay got back onto dry land and I wasn’t sure what Sebastian would think about going into the opaque, mud bog of a water crossing. He put his nose right to the murky surface and slopped right through. The next portion of water was clear and faster moving. When he stopped in the middle I thought “What a smart Mustang! Drinking already!” Instead he began pawing the water in great splooshy waves onto Barbara and Tuscany before dropping down to his knees into the water. At this point I was kicking his sides and yelling, “Get up! Get up!” (at least I hope that’s what I was yelling). Fortunately this worked and we did not roll in the river at 7:20 am. Would have been an uncomfortable morning. 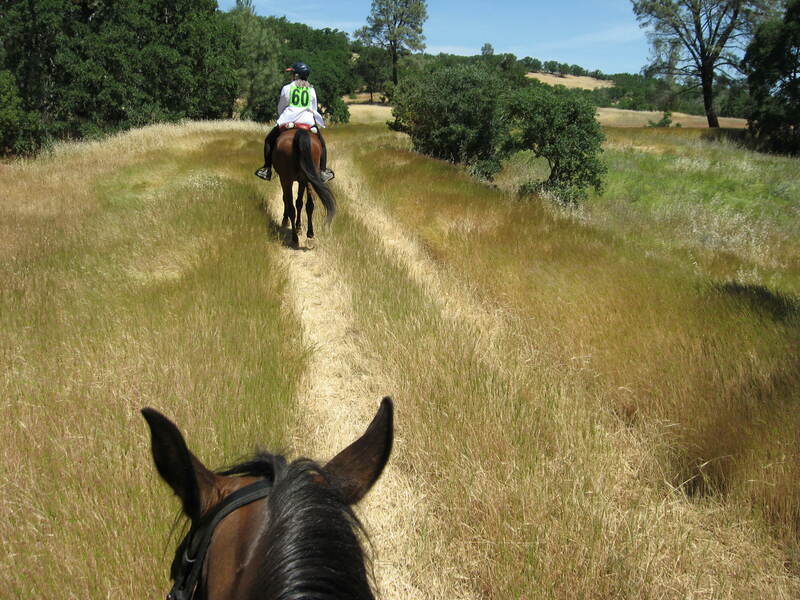 Turns out Tuscany and Barbara were perfect ride partners. Tuscany has a 6 mile an hour walk when he is really going. Sigh. That’s the Big Walk of my dreams. At the start of the ride, when the air was thickest with nervous energy , Sebastian almost matched that Big Walk. Perhaps he does have it in him! Shortly, however, he relaxed into his usual amble. We obviously did some hustles to catch up but Tuscany and Barbara kept us at an excellent pace for the ride. Here Tuscany leads us up one of the early ascents. The ride was beautiful. The grass had this soft, pet-able look to it that made the hills look like big sleeping cats. The heat crept up on us and never felt terribly oppressive. There was even still some green. At his first vet check Sebastian was fidgety and asking to eat grass the whole time, so his pulse was higher than I was expecting – 48 beats per minute. His respirations were 8 per minute, though, so I felt like the heart rate was likely due to him not being settled. At his second vet check he pulsed down to 40 heart beats and 12 respirations per minute, so I felt like we were on track. Besides the water that the ride management trucked in for us, there were cattle ponds to drink from. 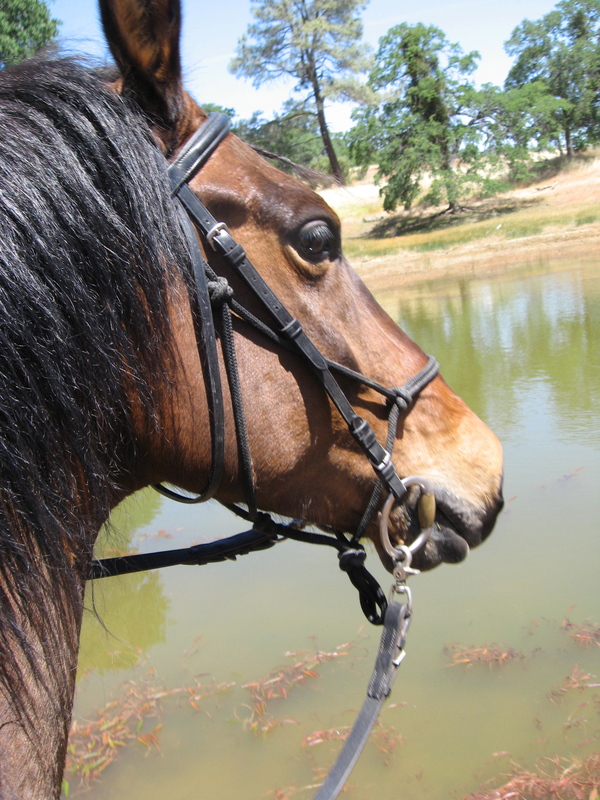 The water was a welcome sight in the heat and Barbara and I had first class insect entertainment while the ponies tanked up. There were the most incredible back and white dragonflies, one type with brilliant white bodies and pitch black wings and another all black with loud white wing stripes. They were not edible, nor did they match the profile of something that might want to eat a horse so Sebastian had no use for them. Overall the ride was moderate- 19 miles of mostly gentle hills with a few steeper climbs and some flat spots to trot if you felt like it. Here we are close to the end. Back at camp I pried boots off and tried to get Sebastian back into presentable shape for the final vet check. No snakes this time. Whew. Apparently the day before the vet almost ran over a rattlesnake making its way out of camp. Vet check was good, I was pleased to hear his hydration was good. It was pretty hot. When I opened my truck cab door to get money out to buy raffle tickets at about 3 in the afternoon I recall thinking “Gee, it can’t be very hot because the inside of my truck isn’t even hot.” In retrospect, I’m pretty sure this was a sensory illusion caused by the fact that the ambient temperature was as hot as the inside of a sealed up truck cab parked in the sun. Yikes. 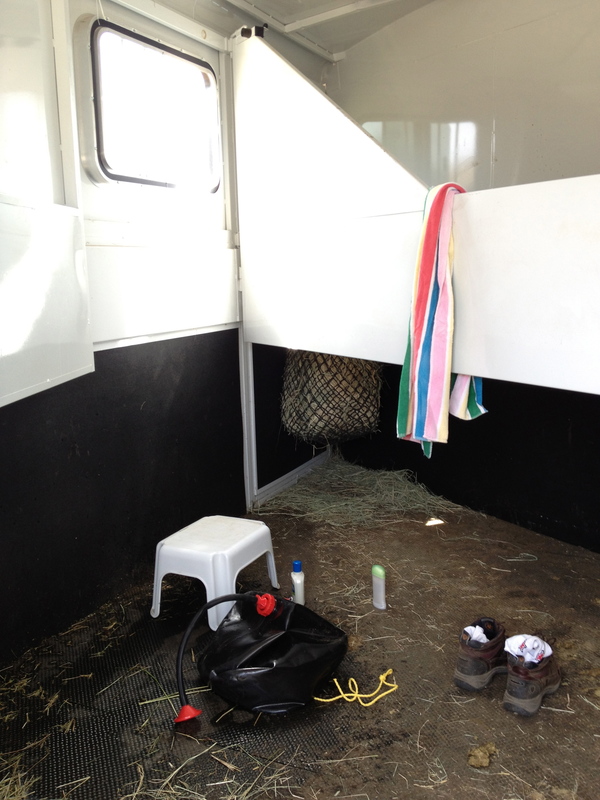 Non-horsey friends, this is the second stall in my horse trailer. That green puck just south of my boots is indeed a small sample from the larger pile of horse manure just out of the frame. Moments before the black shower apparatus was hanging from the horse tie point up above to allow gravity to work its magic. Perfect. Here I am with Bastian, revived enough to take silly photos. 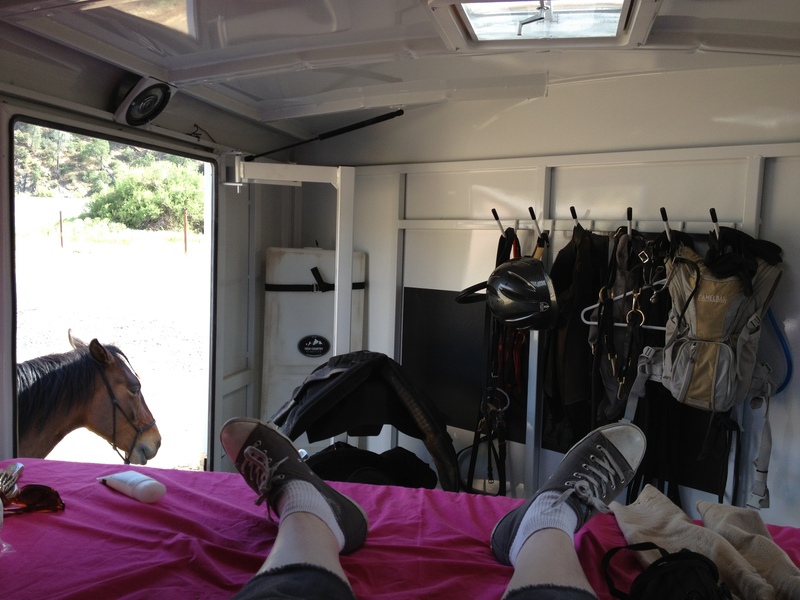 The revival was followed by a nap up in the gooseneck of the trailer. At the awards ceremony I was very brave and invited myself to sit with some people who turned out to be delightful folks. In the end Sebastian won his class with a perfect score on his vet card! He also won the sweepstakes again! Unbelievable. Just two weeks until the Round Valley ride. I’m hooked! 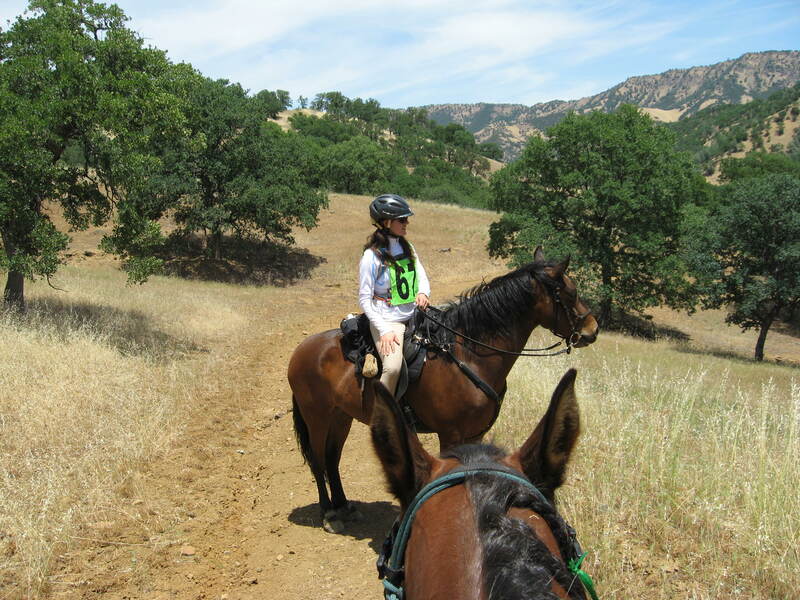 This entry was posted in Horses and tagged competitve trail riding, horses, NATRC, natural horsemanship on June 8, 2012 by fullheartsfarm. Boy you’re a great inspiration, maybe one day we can go together. Congratulations to you and Sebastian !